Caution: be advised that these tend to be large files. Importing them will consume considerable Web bandwidth and connect time. Attn. Journalists and Photo Editors: please check our Fair Use Policy before reproducing any of these images. Thank you. Please note that suggested contributions listed here are subject to change, as domestic and international postal rates vary. New prices will be posted to this website from time to time. 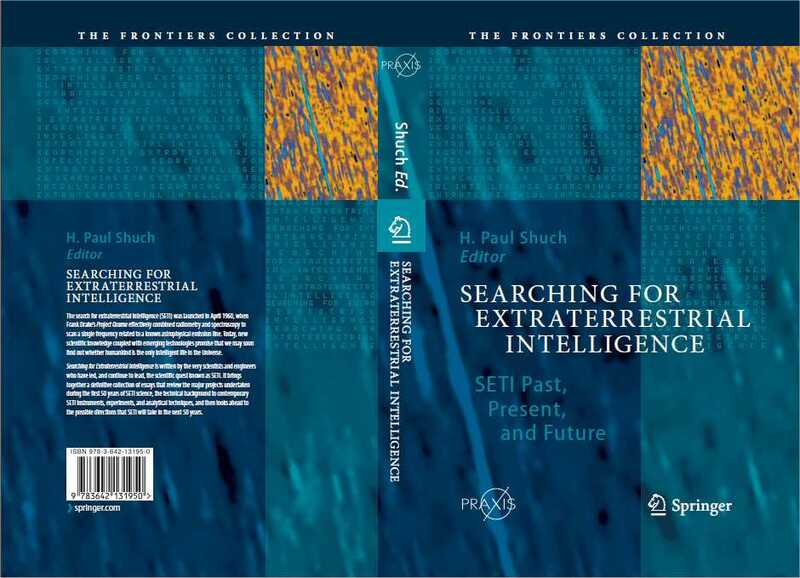 Searching for Extraterrestrial Intelligence: SETI Past, Present, and Future (ISBN 978-3-642-13195-0), a 2010 collection of essays by 27 leading thinkers in the SETI community, was compiled by executive director emeritus H. Paul Shuch to honor fifty years of SETI observations. Executive director H. Paul Shuch's long-awaited hypertext book has been released on CD-ROM. Published by the American Radio Relay League, Tune In The Universe! 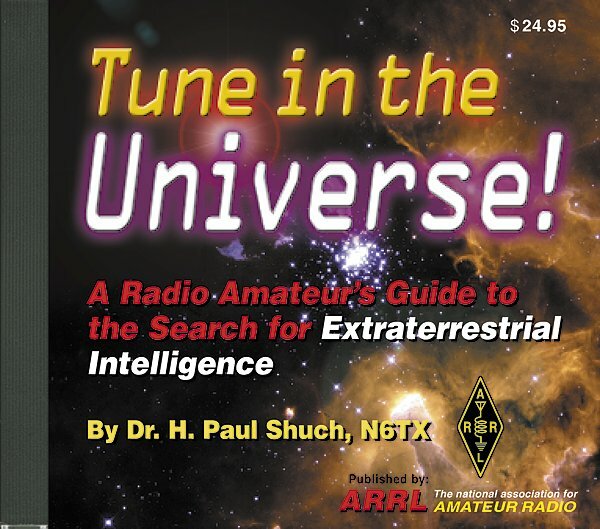 (ISBN 0-87259-854-3) is a radio amateur's guide to the Search for Extra-Terrestrial Intelligence. 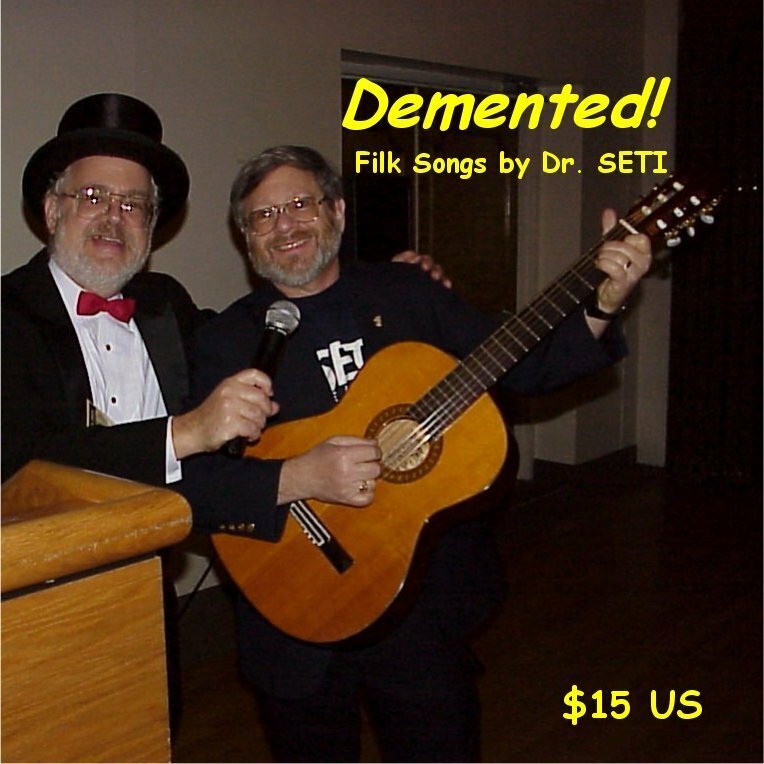 As a bonus, it includes a sampling of Dr. SETI's popular songs. Suggested Contribution: $25 postpaid in US/Canada, $30 postpaid elsewhere. 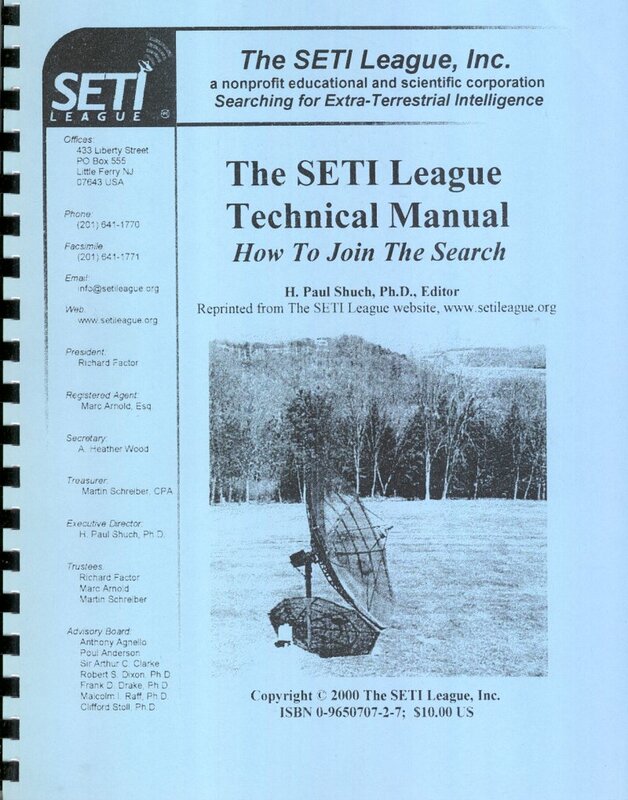 The SETI League Technical Manual details how to build your own radio telescope, suitable for interstellar communications. ISBN 0-9650707-2-7. Suggested Contribution: $10 postpaid in US/Canada, $13 postpaid elsewhere. 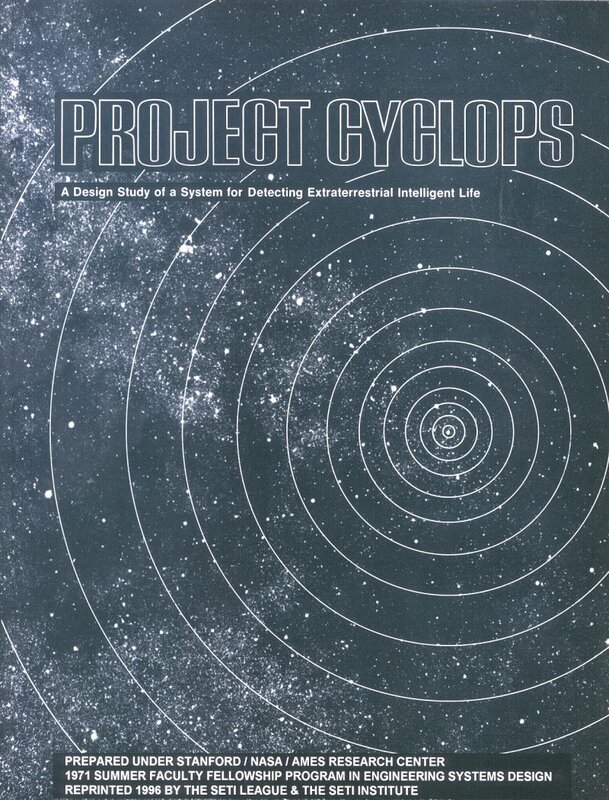 Project Cyclops is the report of the 1971 NASA summer study group on interstellar communications. This book, The SETI League's own facsimile reprint of the seminal SETI technical publication, describes the greatest radio telescope never built. A must for every SETIzen's library. ISBN 0-9650707-0-0. Suggested Contribution: $20 postpaid in US/Canada, $30 postpaid elsewhere. The Listeners, the classic SETI science fiction novel by James Gunn (2004 edition, with Introduction by H. Paul Shuch). ISBN 1-932100-12-1. Suggested Contribution: $15 postpaid in US/Canada, $21 postpaid elsewhere. 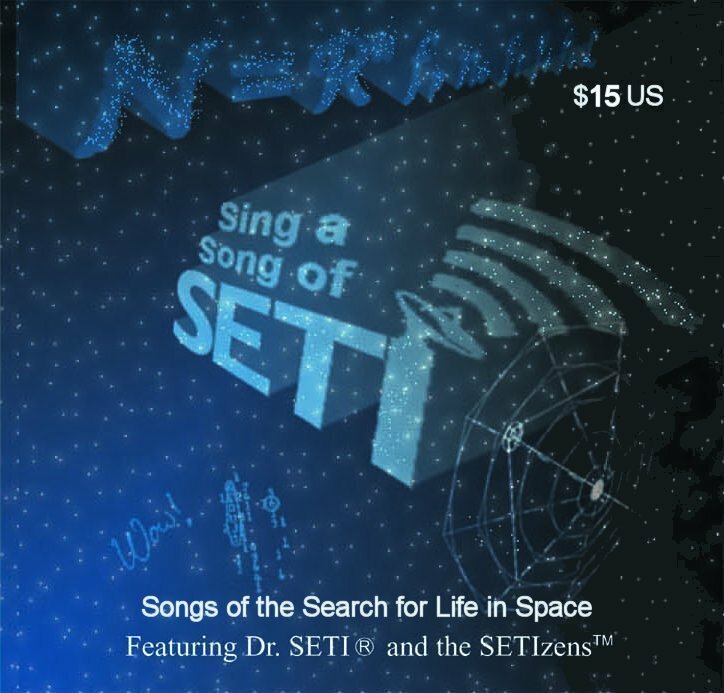 Sing a Song of SETI CD, twelve of Dr. SETI's most popular SETI songs in standard audio format, so you can sing along at home or in your car. Suggested Contribution: $15 postpaid in US/Canada, $18 postpaid elsewhere. 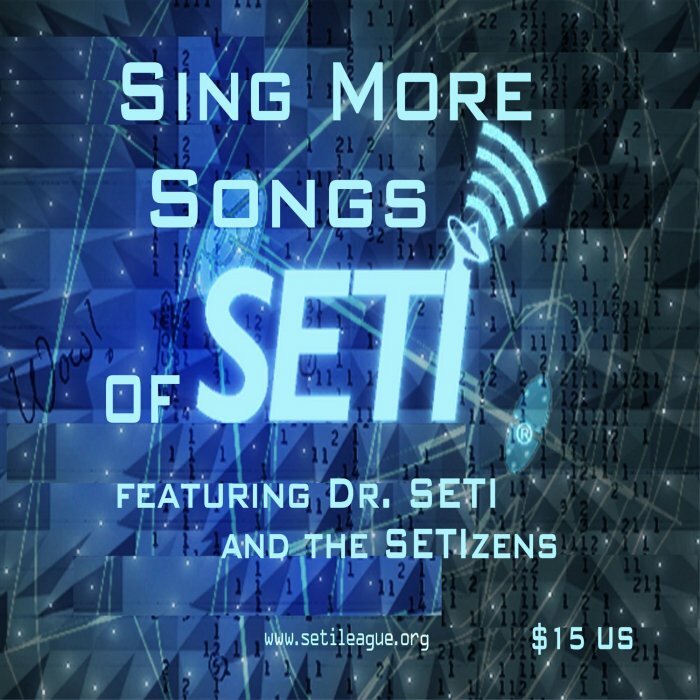 Sing More Songs of SETI CD, twelve more popular Dr. SETI songs in standard audio format, so you can sing along at home or in your car. Demented! 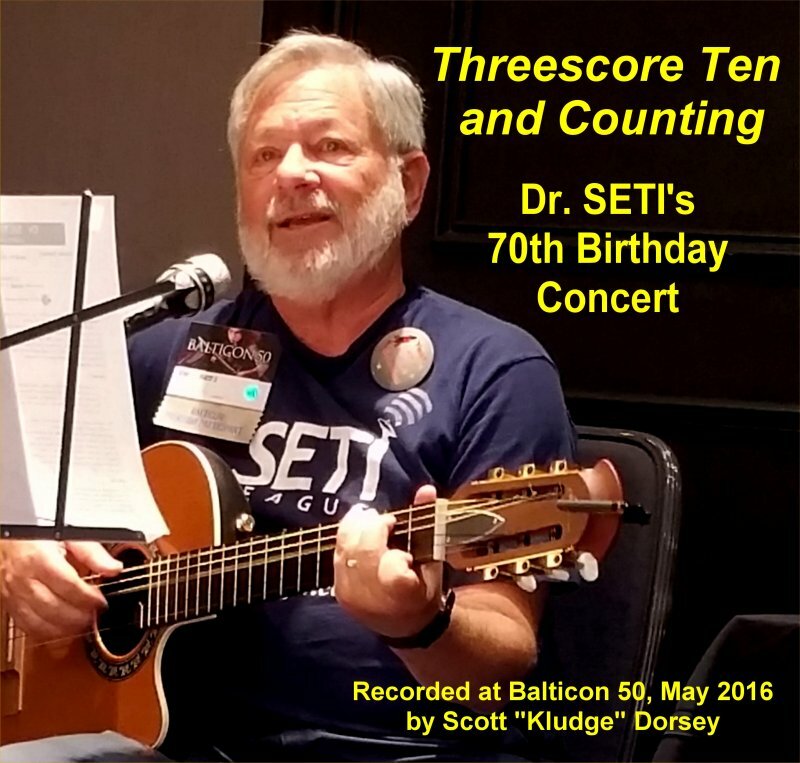 CD, another dozen Dr. SETI science and technology filk songs in standard audio format, so you can sing along at home or in your car. 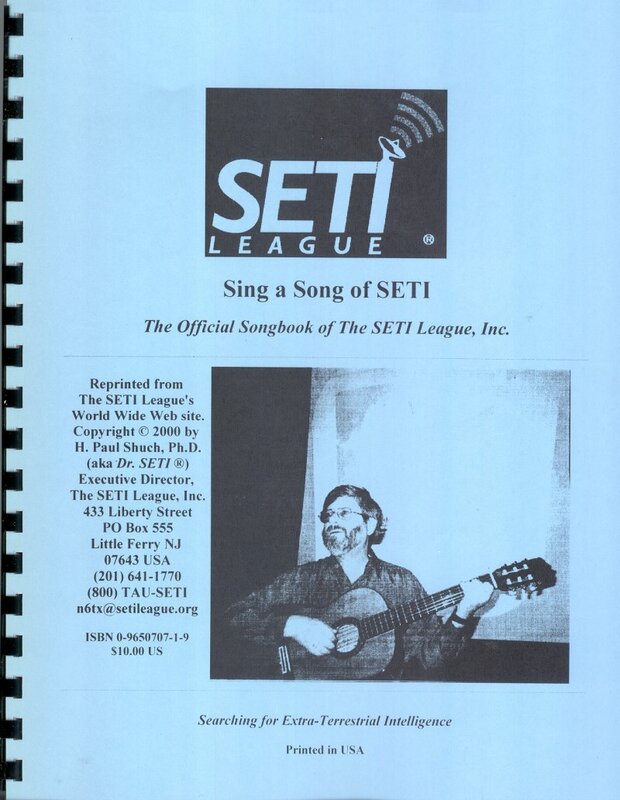 Sing a Song of SETI, the official songbook of The SETI League, Inc., is a collection of 17 folk songs about SETI, radio astronomy, and the search for other worlds. ISBN 0-9650707-1-9. 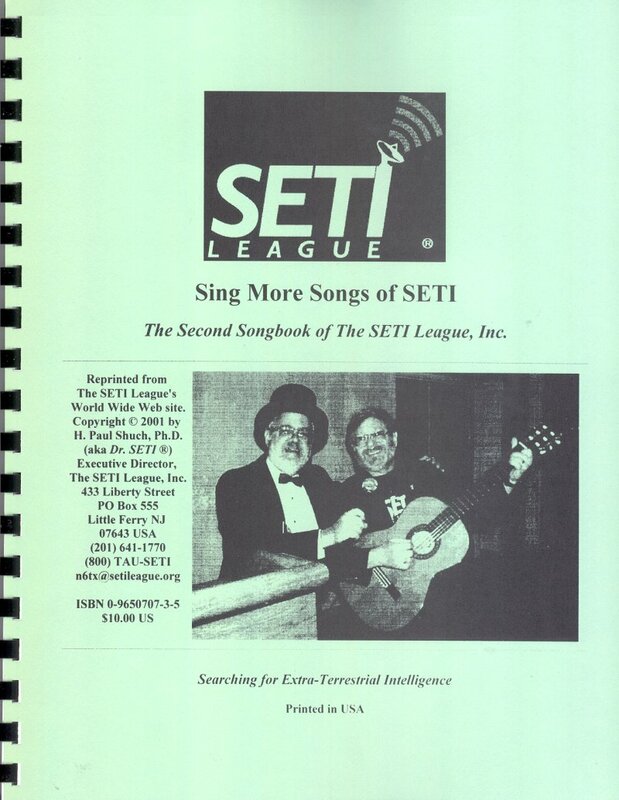 Sing More Songs of SETI (the green book) takes over where the first SETI League songbook (the blue one) left off. 17 more folk songs about SETI, radio astronomy, and the search for other worlds. ISBN 0-9650707-3-5. 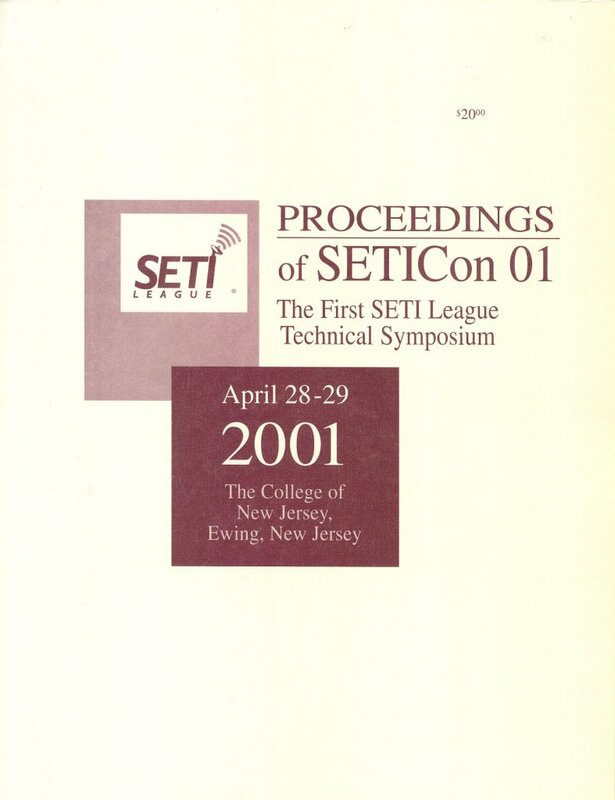 Proceedings of SETICon01: a collection of papers submitted for The SETI League's first Technical Symposium, published by the American Radio Relay League. Must reading for every serious SETIzen. ISBN 0-87259-830-6. Suggested Contribution: $20 postpaid in US/Canada, $27 postpaid elsewhere. 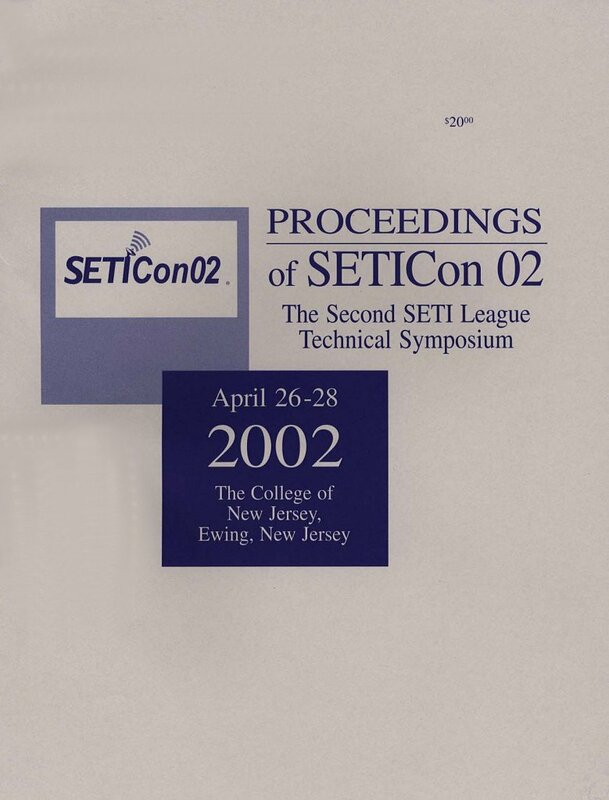 Proceedings of SETICon02: a collection of papers submitted for The SETI League's 2002 Technical Symposium, published by the American Radio Relay League. Must reading for every serious SETIzen. ISBN 0-87259-866-7. 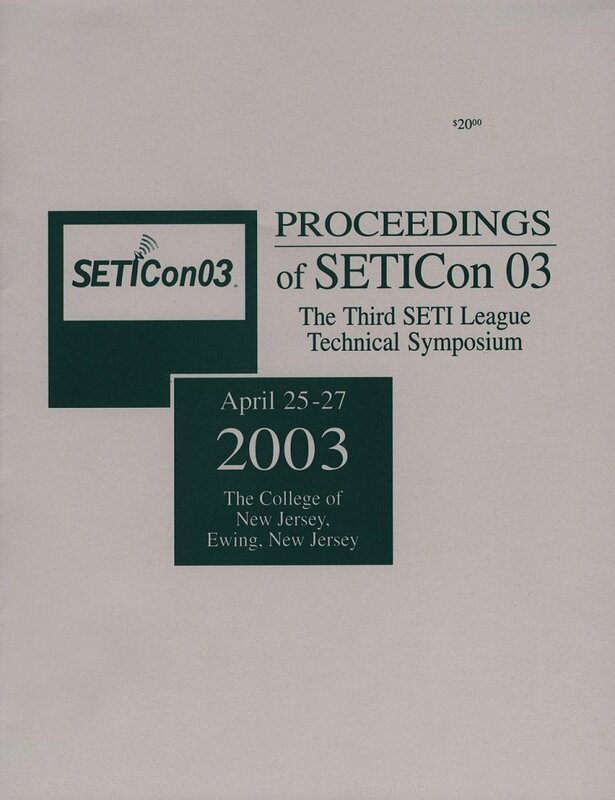 Proceedings of SETICon03: a collection of papers submitted for The SETI League's 2003 Technical Symposium, published by the American Radio Relay League. Must reading for every serious SETIzen. ISBN 0-87259-896-9. Proceedings of EuroSETI04: our first Conference Proceedings on CD-ROM. Hypertext (read it with your web browser); includes abstracts, papers, photos, software, songs, and presentation graphics. Proceedings of SETICon04: another Conference Proceedings on CD-ROM. Hypertext (read it with your web browser); includes abstracts, papers, photos, graphics, and songs, plus an archive of the first ten years of SearchLites, our quarterly newsletter. 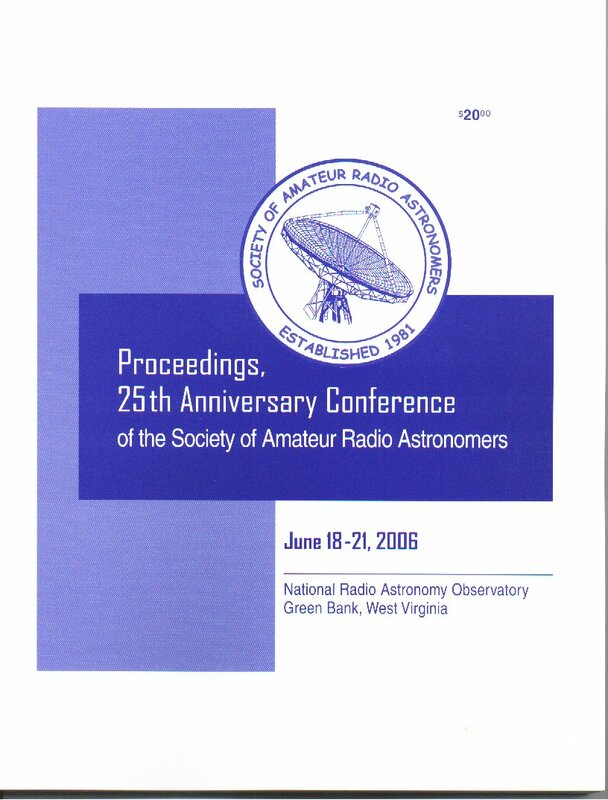 Proceedings, 25th Anniversary Conference of the Society of Amateur Radio Astronomers. 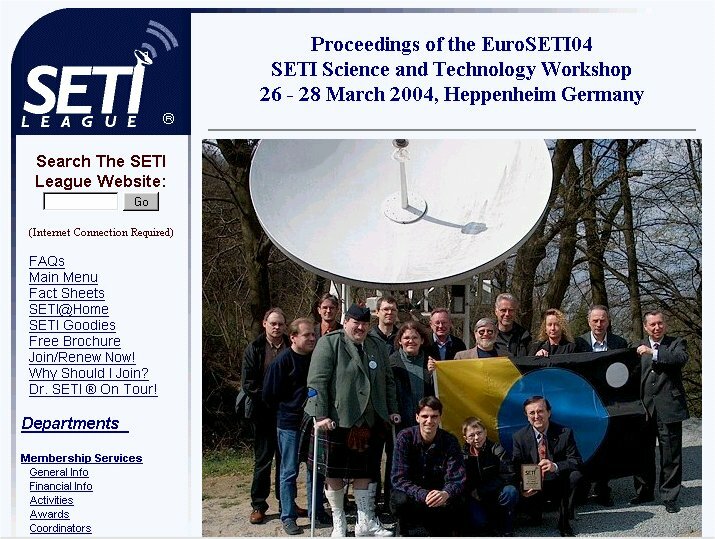 Many SETI League members contributed to this June 2006 Conference, hosted by our sister society, SARA. Published by the American Radio Relay League. ISBN 0-87259-970-1. 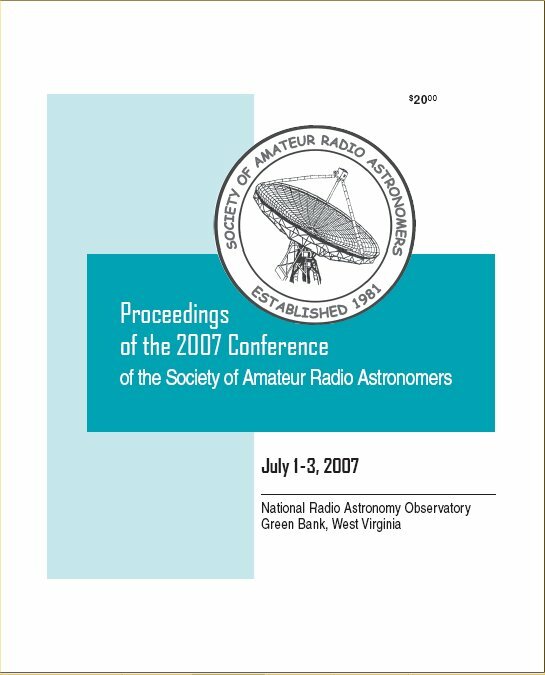 Proceedings of the 2007 Conference of the Society of Amateur Radio Astronomers. 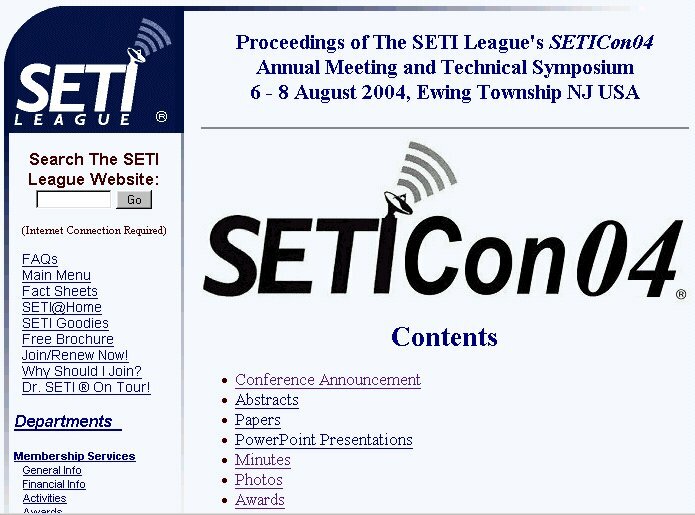 Many SETI League members contributed to this July 2007 Conference, hosted by our sister society, SARA. Published by the American Radio Relay League. ISBN 0-87259-997-3. 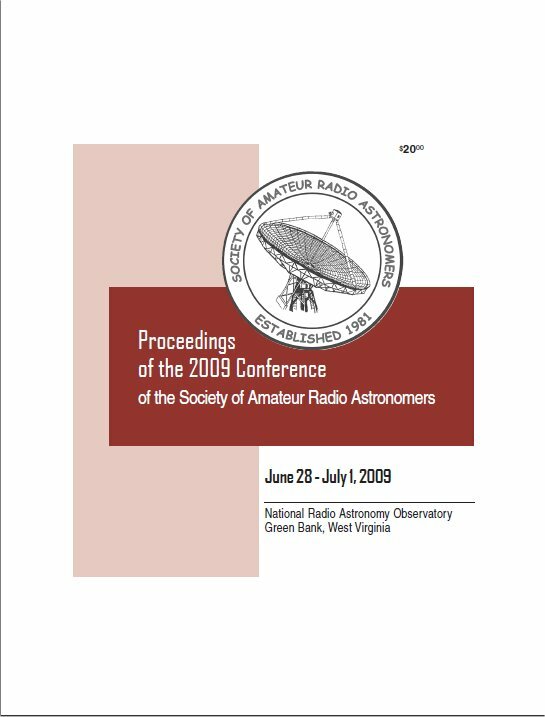 Proceedings of the 2008 Conference of the Society of Amateur Radio Astronomers. Many SETI League members contributed to this June 2008 Conference, hosted by our sister society, SARA. Published by the American Radio Relay League. ISBN 0-87259-136-0. 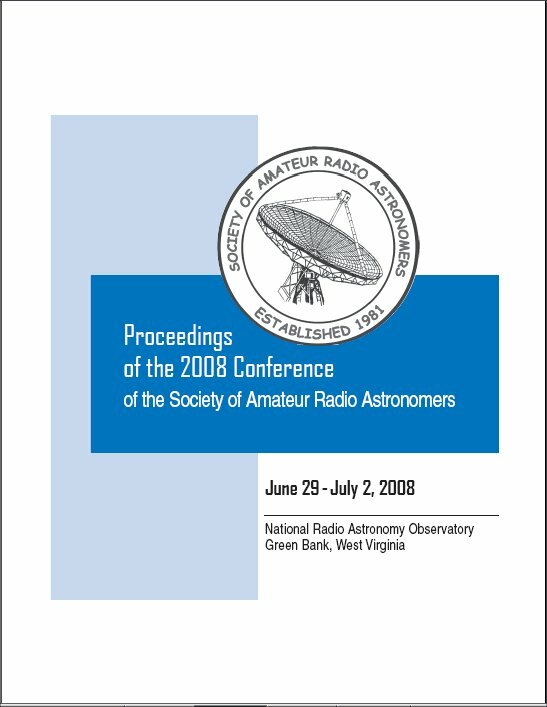 Proceedings of the 2009 Conference of the Society of Amateur Radio Astronomers. Many SETI League members contributed to this June 2009 Conference, hosted by our sister society, SARA. Published by the American Radio Relay League. ISBN 0-87259-968-X. 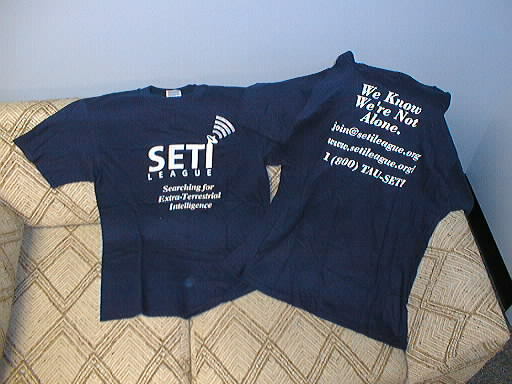 The official SETI League T-Shirt shows our logo and "Searching for Extra-Terrestrial Intelligence" on the front, "We Know We're Not Alone" and contact information on the back. Hanes Beefy-T 100% preshrunk cotton, available in size Medium, Large, or Extra Large. Suggested Contribution: $15 postpaid in US/Canada, $22 postpaid elsewhere. 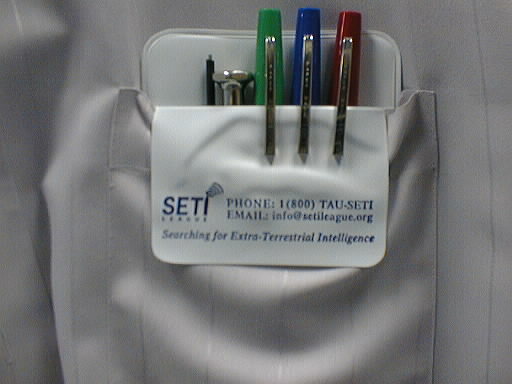 The official SETI League Pocket Protector shows our logo and contact information in blue print on cheap white plastic. Declare your nerd-dom proudly. Suggested Contribution: $3 postpaid in US/Canada, $4 postpaid elsewhere. 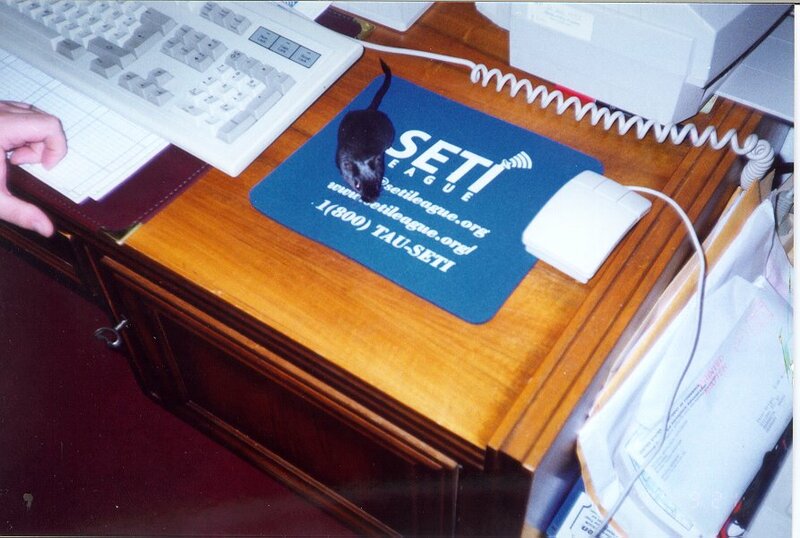 The official SETI League Mouse Pad shows our logo and contact information in white print on blue background. Not recommended for the computer-illiterate. Rodent not included. Suggested Contribution: $5 postpaid in US/Canada, $7 postpaid elsewhere. 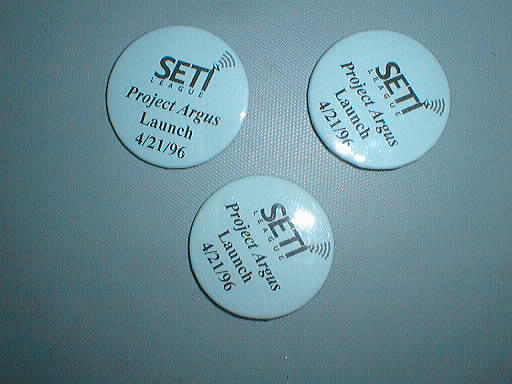 SETI League Buttons dress up any outfit. Three slogans available: "We Know We're Not Alone," "We're All Ears," and "Project Argus Launch." Suggested Contribution: $2 each postpaid in US/Canada, $3 each postpaid elsewhere. SETI League supporters can now own a piece of history. When the Ohio State University "Big Ear" radio telescope was demolished in January 1998, we salvaged a hundred pieces of its mesh surface. 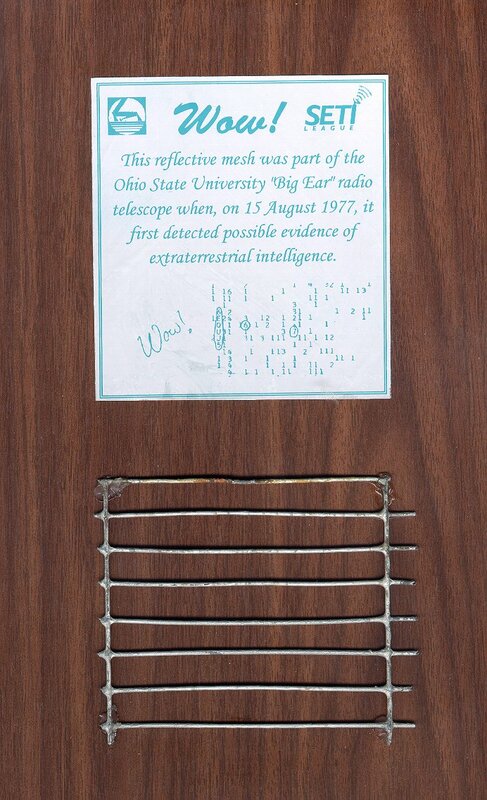 Now you can obtain a handsome plaque honoring one of the world's great radio telescopes, home to the longest running SETI project ever. The half-wavelength square of "Big Ear" mesh was actually illuminated by photons from the famous "Wow!" signal, the most enigmatic of all SETI candidates. All proceeds shared equally between The SETI League, Inc. and the North American AstroPhysical Observatory (NAAPO), longtime operators of the Ohio State University radio telescope. Suggested Contribution: $100 postpaid in US/Canada, $125 postpaid elsewhere. Announcing: The Ultimate SETI Nerd Gift Set! Our four hottest items, together for one low members-only price. We've bundled a pocket protector, mouse pad, Project Cyclops reprint, and the latest edition of the SETI League Technical Manual, at 20% savings! If you're a SETI League member in good standing, all this can be yours for a suggested contribution of just $30 postpaid to US/Canadian addresses; $45 postpaid elsewhere. Individual items pictured above.